Do you know what you are, capsuleer? The truth will not comfort you. You are a frightened child running headfirst towards oblivion. I am the only one who tried to stop you. I am the Messiah that you turned against. You persecuted me, hunted my children. Vowed to burn my Promised Land to ash. Now I have returned, and I know you better than you know yourself. I will vanquish your fear, and commute your flesh to dust. The Revenant is a Sansha's Nation supercarrier. It is only available from very rare BPC drops from Sansha's Nation motherships in incursions in low security space. It requires both Caldari and Amarr carrier skills to fly. With 7 mids and 4 lows the Revenant is designed to be a shield tanker. 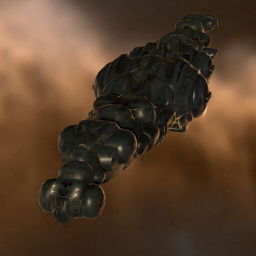 Due to the rarity of the blueprint and the effort required to construct them, Revenants are by far the scarcest type of supercapital ship, and rank highly among the rarest non-limited edition ships in the game. Throughout the history of New Eden, only a few Revenants have ever been destroyed - with the first being killed by Black Legion on the 8th of July 2013, and the sacrifice of a second being the focal point of a player event hosted on the 5th of September 2014. The third was killed by a Pandemic Legion drive-by Doomsday on the 1st of March 2015. The fourth Revenant was destroyed on the 8th of July 2015, and was piloted by an alt of TinkerHell of Cynosural Field Theory, who lost it to Snuffed Out. Further information about additional or recommended skills to pilot Revenant for a specific or it's common role(s) can be written here. No sub-article about Revenant roles or piloting tactics. You can write them here. You can write additional notes for Revenant here. This page was last modified on 21 December 2018, at 02:12. This page has been accessed 119,698 times.